Journal of the House of Lords: Volume 14, 1685-1691. Originally published by His Majesty's Stationery Office, London, 1767-1830. DIE Sabbati, 20 die Aprilis. Bill for Exportation of Corn. D. of Cumberland introduced, and takes the Oaths. Message from the King, that He will support the Protestant Religion;--recommending Toleration for the Dissenters; and that He will summon a Convocation. To be printed, with the Address. Message from H. C. for a Conference on the Bill for abrogating the Oaths. Commons Reasons for not agreeing to the Lords Amendments. Protest against not agreeing with H. C.
Oates versus Regem, in Error. Committee to prepare Heads for a Conference on the Bill for abrogating the Oaths. L. Morley, Privilege. Brown and Tysan released. E. Macclesfield versus Sir A. Fitton and Joliffe. Epus. Sarum. Comes Danby, L. President. Marq. de Halyfax, C. P. S.
Duke of Norfolk, Comes Marescallus. Comes Lyndsey, L. Great Chamberlain. Comes de Dorset, L. Chamberlain. M. de Halyfax Speaker pro Tempore. Who brought up, "An Act for the explaining and making effectual a Statute made in the First Year of King James the Second, concerning the Haven and Piers of Great Yarmouth;" to which their Lordships Concurrence is desired. Who brought up a Bill, intituled, "An Act to enable Younger Cooke Esquire to sell Lands, to pay his Debts, and provide for his Younger Children;" to which their Lordships Concurrence is desired. The Earl of Macclesfeld reported, "That the Committee have considered the Bill for the encouraging the Transportation of Corn; and do think it fit to pass as it is, without any Amendments." Hodie 3a vice lecta est Billa, "An Act for the encouraging the Transportation of Corn." The Question being put, "Whether this Bill shall pass? This Day George Duke of Cumberland was introducted, between the Duke of Somerset and the Duke of Ormond (all being in their Robes), the Usher of the Black Rod and Garter King at Arms going before, carrying his Patent and Writ of Summons; and the next to them the Lord Great Chamberlain, and the Earl Marshal of England. His Patent and Writ of Summons was presented by Garter to the Speaker, on the Woolsack; who delivered the same to the Clerk of the Parliaments; who brought them to the Table, and read them. The Patent bears Date 6° Aprilis, A° 1mo Gulielm et Mariæ; and the Writ of Summons is dated the 13th of April, A° 1mo Guilielmi Regis et Mariæ Reginæ; and then he was brought and placed in his due Place. George Duke of Cumberland took the Oaths, and made and subscribed the Declaration, appointed by the Acts. 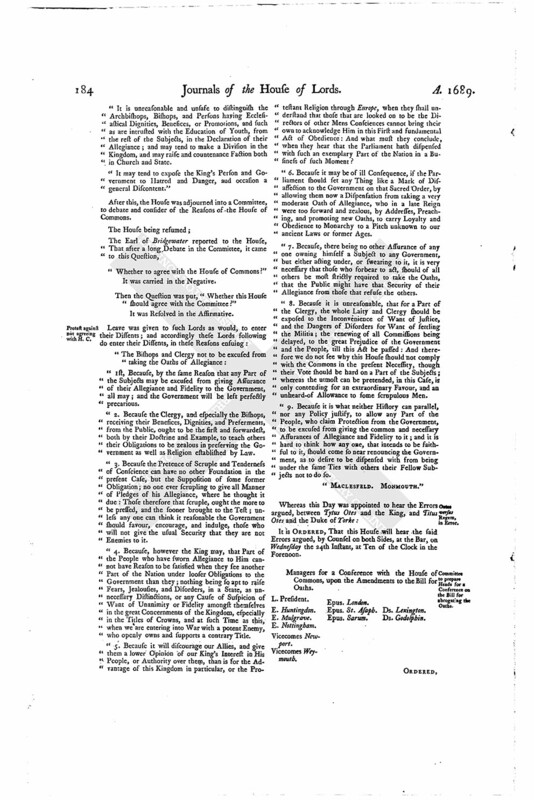 "Though I have had many Occasions of assuring you, that I will maintain the Church of England as by Law established; yet I am well pleased with every Opportunity of repeating those Promises; which I am resolved to perform, by supporting this Church, whose Loyalty, I doubt not, will enable Me to answer your just Expectations. "And as My Design in coming hither was to rescue you from the Miseries you laboured under; so it is a great Satisfaction to Me, that, by the Success GOD has given Me, I am in a Station of defending this Church, which has effectually shewn her Zeal against Popery, and shall always be My peculiar Care; and I do hope the Ease you design to Dissenters will contribute very much to the Establishment of this Church; which therefore I do earnestly recommend to you, that the Occasions of Differences and mutual Animosities may be removed; and, as soon as conveniently may be, I will summon a Convocation." ORDERED, That the Address of both Houses, with this His Majesty's Answer, shall be printed and published. To desire a Conference, concerning the Amendments sent down from this House, in the Bill for abrogating the Oaths of Allegiance and Supremacy. That this House will give a Conference, as is desired; and appoints the same to be presently, in the Painted Chamber. Vicecomes Weymouth. Epus. of London. Because it hath been the Policy of the Common Law and Statute Law, to oblige Men to swear Allegiance to the King. "Allegiance is the common and necessary Duty of all Subjects, and is most strictly to be required of Archbishops, Bishops, and those who have Ecclesiastical Dignities, Benefices, or Promotions, in regard they are highly intrusted in the Administration of the Government, draw great Dependencies, and are exemplary to the rest of the People; and several of them are by Law to administer the Oath of Allegiance to other Persons. Allegiance is also strictly to be required of all Governors, Professors, and Fellows in Universities, and Schoolmasters, because to them the Education of the Youth of the Kingdom is committed; and therefore they ought to be Persons of known Loyalty and Affection to the Government. "The taking the Oaths publicly in open Court will better manifest Allegiance than the taking them privately before Persons appointed by Order in Council, and will be much more safe for the Persons who are obliged to take the Oaths. "The best and most certain Means to have the Oaths taken is, to impose it upon the Persons concerned to tender themselves to take the said Oaths under Penalties; but, if the Oaths are not required to be taken unless tendered, the said Persons might, by Absence and otherwise, avoid the taking them with Impunity. "The Clause which the Commons sent to your Lordships allows more Favour to the Archbishops, Bishops, and those that have Ecclesiastical Dignities or Promotions, than to any Lay Peers, or other Persons having Offices or Employments; and is more gentle in the Penalty than the Statures heretofore made in like Case. 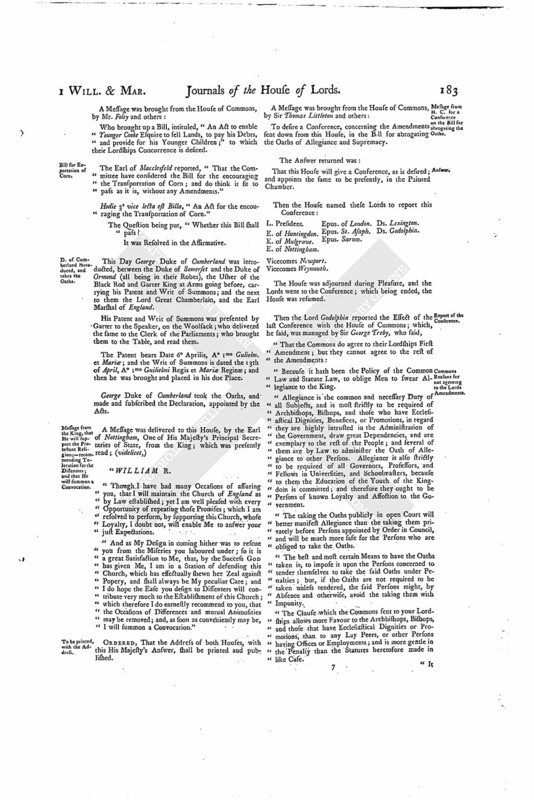 "It is unreasonable and unsafe to distinguish the Archbishops, Bishops, and Persons having Ecclesiastical Dignities, Benefices, or Promotions, and such as are intrusted with the Education of Youth, from the rest of the Subjects, in the Declaration of their Allegiance; and may tend to make a Division in the Kingdom, and may raise and countenance Faction both in Church and State. "It may tend to expose the King's Person and Government to Hatred and Danger, and occasion a general Discontent." After this, the House was adjourned into a Committee, to debate and consider of the Reasons of the House of Commons. "Whether to agree with the House of Commons?" It was carried in the Negative. Then the Question was put, "Whether this House should agree with the Committee?" "1st, Because, by the same Reason that any Part of the Subjects may be excused from giving Assurance of their Allegiance and Fidelity to the Government, all may; and the Government will be left perfectly precarious. "2. Because the Clergy, and especially the Bishops, receiving their Benefices, Dignities, and Preferments, from the Public, ought to be the first and forwardest, both by their Doctrine and Example, to teach others their Obligations to be zealous in preserving the Government as well as Religion established by Law. "3. Because the Pretence of Scruple and Tenderness of Conscience can have no other Foundation in the present Case, but the Supposition of some former Obligation; no one ever scrupling to give all Manner of Pledges of his Allegiance, where he thought it due: Those therefore that scruple, ought the more to be pressed, and the sooner brought to the Test; unless any one can think it reasonable the Government should favour, encourage, and indulge, those who will not give the usual Security that they are not Enemies to it. "4. Because, however the King may, that Part of the People who have sworn Allegiance to Him cannot have Reason to be satisfied when they see another Part of the Nation under looser Obligations to the Government than they; nothing being so apt to raise Fears, Jealousies, and Disorders, in a State, as unnecessary Distinctions, or any Cause of Suspicion of Want of Unanimity or Fidelity amongst themselves in the great Concernments of the Kingdom, especially in the Titles of Crowns, and at such Time as this, when we are entering into War with a potent Enemy, who openly owns and supports a contrary Title. "5. Because it will discourage our Allies, and give them a lower Opinion of our King's Interest in His People, or Authority over them, than is for the Advantage of this Kingdom in particular, or the Protestant Religion through Europe, when they shall understand that those that are looked on to be the Directors of other Mens Consciences cannot bring their own to acknowledge Him in this First and fundamental Act of Obedience: And what must they conclude, when they hear that the Parliament hath dispensed with such an exemplary Part of the Nation in a Business of such Moment? "6. 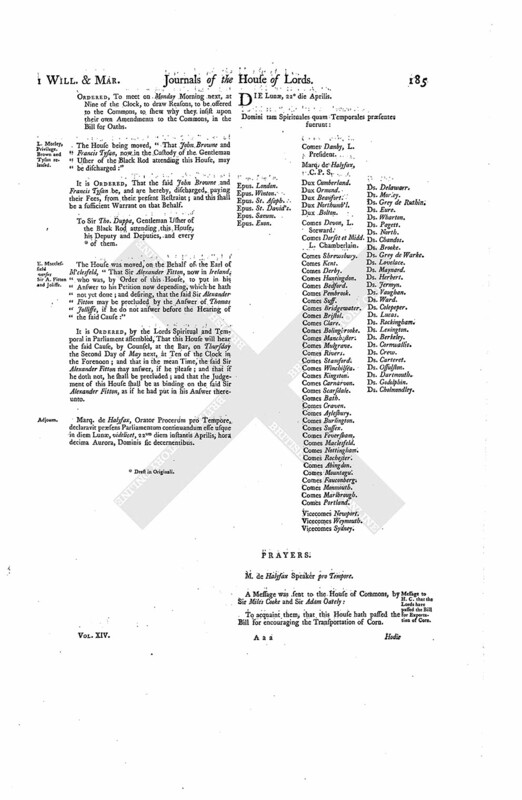 Because it may be of ill Consequence, if the Parliament should set any Thing like a Mark of Disaffection to the Government on that Sacred Order, by allowing them now a Dispensation from taking a very moderate Oath of Allegiance, who in a late Reign were too forward and zealous, by Addresses, Preaching, and promoting new Oaths, to carry Loyalty and Obedience to Monarchy to a Pitch unknown to our ancient Laws or former Ages. "7. Because, there being no other Assurance of any one owning himself a Subject to any Government, but either acting under, or swearing to it, it is very necessary that those who forbear to act, should of all others be most strictly required to take the Oaths, that the Public might have that Security of their Allegiance from those that refuse the others. "8. 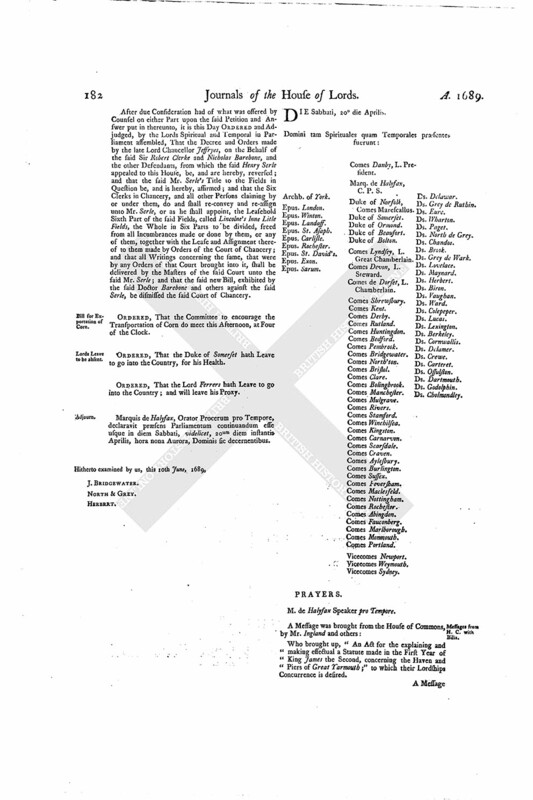 Because it is unreasonable, that for a Part of the Clergy, the whole Laity and Clergy should be exposed to the Inconvenience of Want of Justice, and the Dangers of Disorders for Want of settling the Militia; the renewing of all Commissions being delayed, to the great Prejudice of the Government and the People, till this Act be passed: And therefore we do not see why this House should not comply with the Commons in the present Necessity, though their Vote should be hard on a Part of the Subjects; whereas the utmost can be pretended, in this Case, is only contending for an extraordinary Favour, and an unheard-of Allowance to some scrupulous Men. "9. Because it is what neither History can parallel, nor any Policy justify, to allow any Part of the People, who claim Protection from the Government, to be excused from giving the common and necessary Assurances of Allegiance and Fidelity to it; and it is hard to think how any one, that intends to be faithful to it, should come so near renouncing the Government, as to desire to be dispensed with from being under the same Ties with others their Fellow Subjects not to do so. It is ORDERED, That this House will hear the said Errors argued, by Counsel on both Sides, at the Bar, on Wednesday the 24th Instant, at Ten of the Clock in the Forenoon. Managers for a Conference with the House of Commons, upon the Amendments to the Bill for Oaths. ORDERED, To meet on Monday Morning next, at Nine of the Clock, to draw Reasons, to be offered to the Commons, to shew why they insist upon their own Amendments to the Commons, in the Bill for Oaths. The House being moved, "That John Browne and Francis Tysan, now in the Custody of the Gentleman Usher of the Black Rod attending this House, may be discharged:"
It is ORDERED, That the said John Browne and Francis Tysan be, and are hereby, discharged, paying their Fees, from their present Restraint; and this shall be a sufficient Warrant on that Behalf. To Sir Tho. Duppa, Gentleman Usher of the Black Rod attending this House, his Deputy and Deputies, and every (fn. 1) of them. The House was moved, on the Behalf of the Earl of M'clesfeld, "That Sir Alexander Fitton, now in Ireland, who was, by Order of this House, to put in his Answer to his Petition now depending, which he hath not yet done; and desiring, that the said Sir Alexander Fitton may be precluded by the Answer of Thomas Jolliffe, if he do not answer before the Hearing of the said Cause:"
It is ORDERED, by the Lords Spiritual and Temporal in Parliament assembled, That this House will hear the said Cause, by Counsel, at the Bar, on Thursday the Second Day of May next, at Ten of the Clock in the Forenoon; and that in the mean Time, the said Sir Alexander Fitton may answer, if he please; and that if he doth not, he shall be precluded; and that the Judgement of this House shall be as binding on the said Sir Alexander Fitton, as if he had put in his Answer thereunto. Marq. de Halyfax, Orator Procerum pro Tempore, declaravit præsens Parliamentum continuandum esse usque in diem Lunæ, videlicet, 22um diem instantis Aprilis, hora decima Aurora, Dominis sic decernentibus.